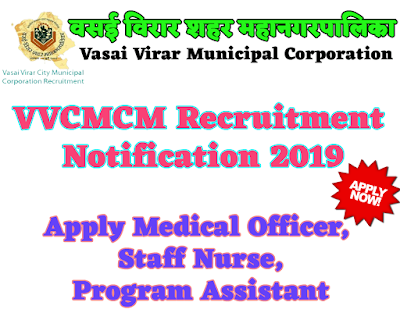 Vasai-Virar City Municipal Corporation (VVCMC) has published an official notification for recruitment of 35 Medical Officer, Staff Nurse, Program Assistant Posts. Interested and Eligible candidates who wants to apply for these posts walk in interview on 02 January 2019 on below given address. For more details like age limit, salary, how to apply, selection process please refer the below article. Maximum age limit for post Medical Officer is 61 years. Maximum age limit for post Staff Nurse is 59 years. Maximum age limit for post Program Assistant is 38 years. Education qualification for post Medical Officer is MBBS. Education qualification for post Staff Nurse is (i) 12th Pass (ii) General Nursing and Midwifery Diploma. Education qualification for post Program Assistant is (i) Graduate Degree (ii) MS-CIT (iii) Marathi typing 30 wpm. and English 40 wpm. For Medical Officer Rs. 50,031/- paid as a Salary. For Staff Nurse Rs. 31,829/- paid as a Salary. For Program Assistant Rs. 18,076/- paid as a Salary. Candidate who wants to apply for this post walk in interview on below given address. 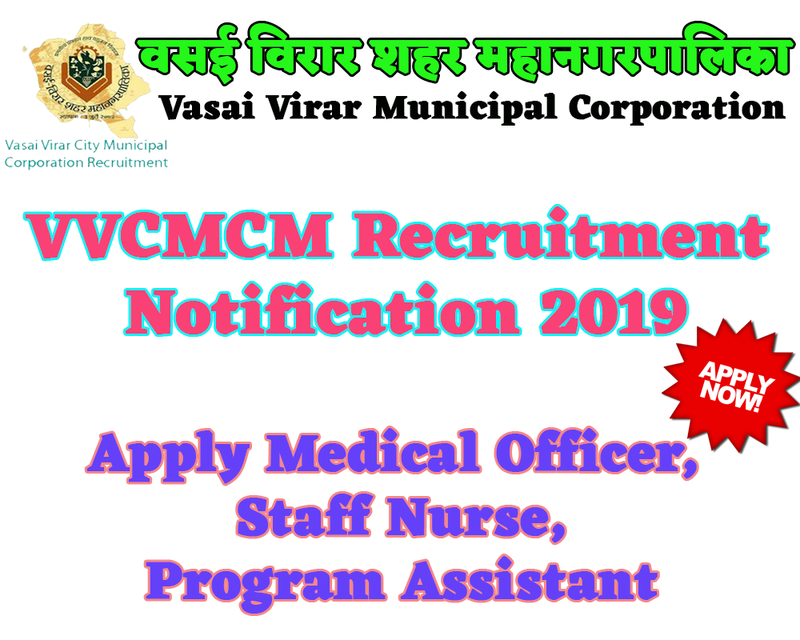 Vasai-Virar City Municipal Corporation, 4th Floor, Municipal Multipurpose Building, Ward Committee, ‘C’ office, Virar (East). Written or Oral Exams can be organized by department. Best performing candidates can be selected for this post.